BEIJING, June 29 (Xinhua) -- China again honored its commitment to opening-up with a shortened negative list for foreign investment, calming multinationals saddened by rising barriers and restrictions elsewhere. On Thursday, China published its latest negative list that specifies sectors off-limits or restricted to foreign investors. The new list will take effect on July 28. The number of items on the list was cut to 48 from 63 in the previous version unveiled one year ago. Under the new list, foreign businesses will gain wider access to sectors including finance, transportation, automobiles, logistics, energy and agriculture. "It is a great progress as over the past few years, the negative list has been dwindled down from over two hundred items," said Harley Seyedin, president of American Chamber of Commerce in South China. China will allow 51-percent foreign ownership of brokerages, futures dealers and life insurers, and remove the cap entirely by 2021, according to the new negative list. Current rules that limit a single foreign investor's stake in a Chinese commercial bank to 20 percent will be abolished on July 28. The rule that caps investment by multiple overseas financial institutions in a Chinese commercial bank below 25 percent will also be lifted. Foreign ownership limits for special vehicle and new energy vehicle manufacturing will be removed on July 28, while those for passenger car manufacturing will be lifted by 2022. Foreign equity caps on ship-building, regional jet design and manufacturing as well as power grid operation will also be lifted on July 28. This is the latest in an array of measures China unveiled this year to expand market access for foreign investors as the country seeks to make new ground in pursuing opening up. In expansion of the commodity market, the country allowed overseas investors to trade in domestic iron ore futures at the Dalian Commodity Exchange last month. Following the launch of the Shanghai- and Shenzhen-Hong Kong stock links, which makes it easier for foreign investors to buy A-shares, a similar program between Shanghai and London is expected this year. "The direction has been very consistent towards opening up, towards liberalizing the market, towards expanding international presence in China, and towards expanding Chinese presence internationally," Nicolas Aguzin, J.P. Morgan Asia-Pacific chairman and CEO, told Xinhua. Opening-up and drawing foreign investment, which used to be viewed by some as swimming with sharks before China's entry into the World Trade Organization (WTO), are now considered as a path to high-quality development. Over the past decades, "opening-up has allowed investment to come to China and allowed companies to bring technology with them to China, which have had a tremendous benefit to the country's growth and prosperity," Seyedin said. The country has remained a magnet for foreign investment. After its WTO entry, foreign direct investment into the country expanded by an annual average of 6.9 percent to 136.32 billion U.S. dollars in 2017. A catfish effect has been created as foreign investment forces domestic businesses to enhance innovation, improve quality and gain an edge in global competition, said Li Dawei, a researcher with Chinese Academy of Macroeconomic Research, a government think tank. Forty years of reform and opening-up has witnessed the number of Chinese companies on the Fortune Global 500 list increase from zero to 115. Domestic businesses have developed the capability to compete with their global peers and seen the benefits of having additional competition. Zotye Auto, an auto maker headquartered in Zhejiang Province in east China's seaboard, expects more opportunities than challenges following the sector's further opening-up. Last year, the company signed an agreement to form a 50-50 percent joint venture with U.S. auto giant Ford to produce electric vehicles for the Chinese market. 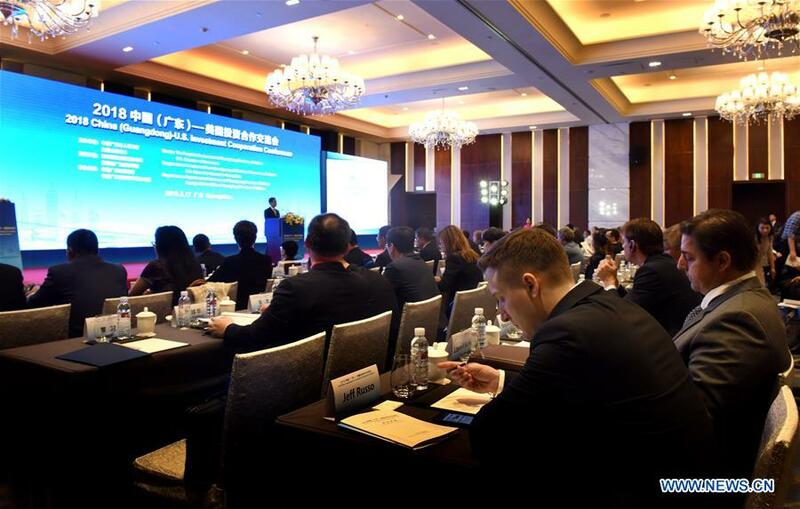 Wu Jun, assistant general manager responsible for marketing overseas, said focusing on long-term development, the company will continue to enhance innovation and increase its R&D input. "When it comes to competition, nationality doesn't matter. What matters is that everyone has the same possibilities, equal access and equal opportunity," said Aguzin. To create a better business environment, the country has stepped up efforts to ease access for foreign investment, strengthen the protection of intellectual property and simplify administrative procedures. China has not only benefited from economic globalization, but also contributed to it. The country's emphasis on opening-up is a choice benefiting both itself as well as the rest of the world. Chinese leaders have repeatedly stated that the country's door of opening-up will not be closed, but will open even wider to share development opportunities with other countries. "China has always been a part of the global economy, and that will never change. It is one of the greatest contributors to the world economic growth, and will continue to be as long as it continues to open its door," Seyedin said. "Everybody is now looking at China as a place of opportunity for investment, growth and prosperity. I see that absolutely." China's GDP growth, though slowing slightly to a medium-high pace, remains stable and sound. Political and economic stability, infrastructure development, healthy resource availability, productivity and a skilled workforce are all attractive factors for foreign investment. As the country tries to pursue growth driven by domestic spending and market forces, more opportunities will be shared. "There is a plan [on opening-up]. We would like to be part of that and take advantages of all the opportunities this market provides," Aguzin said. Operating in China for nearly a century, the Wall Street banking giant still considers the market as its "long-term focus," expecting "even more good things to come, for China, for its companies, for its population and for J.P. Morgan," he said.